“We strongly encourage women to apply.” This is definitely not a statement of equal treatment, writes Audra Baleisis, Academic Platform Coordinator Education, Professional Development, and Diversity of PlanetS. With the following essay, she wants to start a lively discussion about a hot topic. A few months ago, my attention at work was fully focused on writing. Strategy papers and progress reports were due for NCCR PlanetS and I was in charge of one topic in particular. In the original proposal to the SNF, it was called “The Advancement of Women.” In the reports, it became Equal Opportunity and diversity. This reflected input from scientists at the General Assembly in Anzère, that it was important men were included in the discussion, and that discussions of family life and work should not just be limited to women. While writing, I also had a chance to get more familiar with two concepts: equality and equity. The two terms look very similar, but they have quite different meanings. These two paths start with different assumptions and lead to different measures, so I wanted to present them to the NCCR as a whole and invite you to discuss further. Equality is about sameness – everyone gets the same treatment. Equity is about fairness – each person gets what she or he needs to succeed. The cartoon above portrays an equal test. It is one way to judge candidates. But it is hard to argue that it is a fair test. 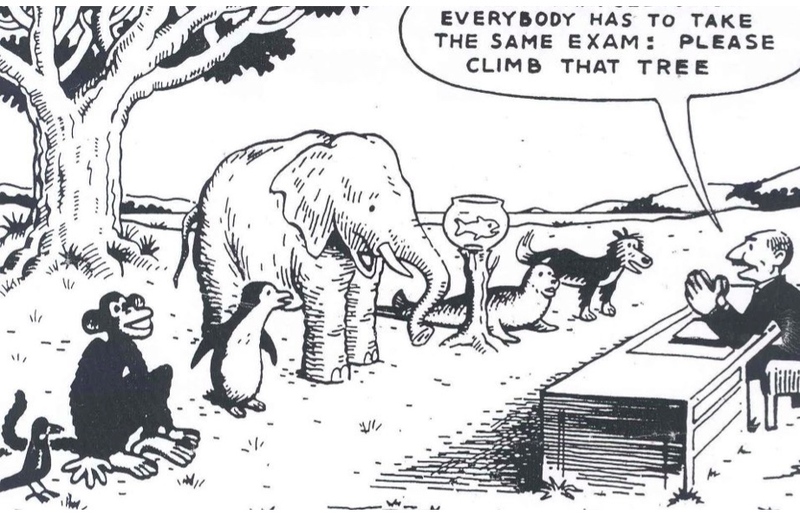 An equitable test, on the other hand, might involve measuring each animal’s speed by having the chimpanzee climb the tree, the elephant and dog run a track, and the penguin, the fish and the seal swim. The goal of diversity in an institution, after all, is to include many different strengths and voices in the group. Diverse groups have been shown to be better problem solvers. Having too many similar individuals limits creativity and the health of a group. 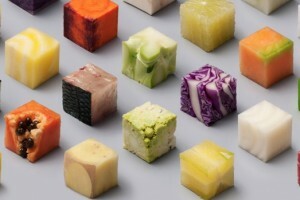 An analogy is nutrition – a person cannot be healthy by eating just one kind of food, no matter how good it is for the body. There is no “most nutritious” food item. Different foods bring different benefits to a body. So what does this have to do with PlanetS and equal opportunity? Any group that wants to somehow impact the diversity of its members has to decide what its goals and measures will be. One approach is to say “we will treat all job applicants the same.” This may lead to increased diversity, but it will only be fair if all applicants start at the same point. And we know this is not the case. Applicants to a postdoc position come from a variety of institutions and advisors and areas of expertise, with more or less influential letters of recommendation. Most hiring committees are aware of this and try to take all of these differences into account – a daunting, and subjective, yet important task. But what about gender differences? We are certainly past the era of “women are not as good as men at mathematics” thinking. It would be nice to think that the playing field is now level and that equal treatment would lead to equitable outcomes. Unfortunately, research across psychology, education and business paints a different picture. I present three examples below. First, women tend to underestimate their abilities, while men overestimate theirs. An internal report from Hewlett-Packard found that, given a list of skills from a job advertisement, women applied for positions for which they felt they were a 100% match, whereas men applied when they felt they matched at least 60% of the job requirements (Sandberg, 2014). Put otherwise, for two candidates with similar skills, the female is less likely to apply for a job than the male. Similar behavior trends have been found across a number of setting, for example, stock market investing strategies (Barber & Odean, 2001). Second, imposing quotas for women increases the probability that a woman will participate in and win a competition (Niederle & Vesterlund, 2010). This was a study of participation in a mathematical game. When there were no quotas imposed, less women chose to compete than similarly performing men. Once quotas were imposed, the number of female competitors and winners increased. Third, people are influenced by culture. We do not exist independent of the world and the stereotypes around us. Regardless of our best intentions, our implicit (unconscious) biases can get in the way of our own attempts at being impartial, including during the process of hiring. The Harvard Implicit Associations test (https://implicit.harvard.edu/implicit/) is designed to measure and show you just how much your split-second reactions are subject to gender, race, religion and other biases. Recent studies of academic science have found the same resume for a lab manager position was evaluated as less competent, and deserving of a lower salary and less mentoring when it had a female name attached to it rather than a male name (Moss-Racusin, et al., 2012). This effect is well known in other disciplines, such as orchestras, where musician auditions are routinely conducted blindly (the evaluators do not see the musician) to decrease gender bias (Goldin & Rouse, 1997). Back to the lead of this piece: “We strongly encourage women to apply.” This is definitely not a statement of equal treatment, but given some of the evidence just presented, perhaps you can see it as the kind of intervention to ensure more equitable (fair) outcomes in the gender make-up of scientists. What do you think? Goldin, C., & Rouse, C. (1997). Orchestrating impartiality: The impact of” blind” auditions on female musicians (No. w5903). National bureau of economic research. Niederle, M., & Vesterlund, L. (2005). Do women shy away from competition? Do men compete too much? (No. w11474). National Bureau of Economic Research. Sandberg, S. (2014). Lean in. Random House.